H.R.G. built light cars and racing specials between 1936 and 1956 in Tolworth, England. There were six factory models offered over the years, built in various amounts. This was not one of them. It is a one-off special commissioned by then-BBC presenter John Gilbert. They took the chassis from their 1500 model and stretched it a little bit (this car looks very long and narrow). Gilbert also had a spare eight-cylinder Maserati engine lying around that came from one of their 1930s Brooklands racers that he wanted installed. The body was built to look like a Maserati racer, too. Eventually, the Maserati engine was replaced – multiple times over the years so it could make more and more power. Right now it houses a 2.4-liter Jaguar straight-six. A six-cylinder Maserati cylinder block is included with this sale. The car was raced at Goodwood back in the day and is fresh off restoration in 2014. It should sell for between $94,000-$110,000. Click here for more info and here for more from this sale. 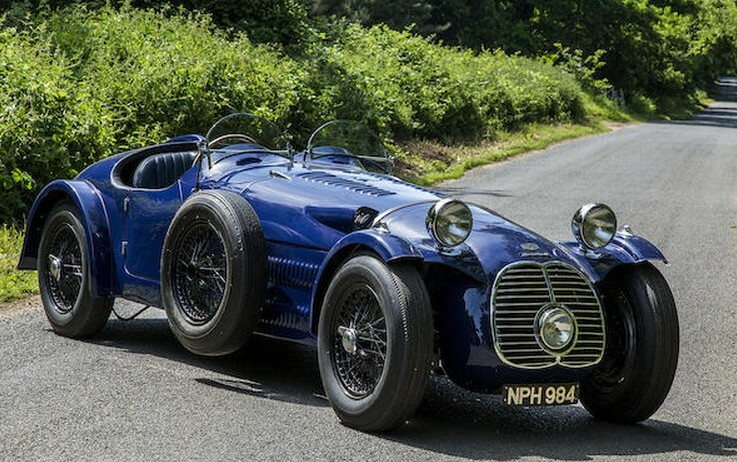 This entry was posted in Uncategorized and tagged 1949, auctions, Bonhams, cars, classic cars, hrg, jaguar, maserati, sports by classiccarweekly. Bookmark the permalink.